This USB C to HDMI Adapter enables you to connect a USB C computer or phone to an HDMI-equipped display,monitor,projector.From small screen to large screen,it’s a good choice to share ideas with your partners or enjoy a better visual feast with your family. For Windows 10, press Windows key + P combination command–>choose Duplicate or Extend. For Windows system laptop, if the external monitor could not work, please update the BIOS and graphic card driver from laptop official website. For MacOS, Please go to Apple icon–>System Preferences–>Sound–>Output, choose your TV as the sound output. For Windows 10, please click right bottom of your sound icon–>choose your TV as the sound output. For Sony TV, if you are running MacOS, you probably need to go to Launchpad–>Other–>Audio MIDI Setup–>DisplayPort–>Output–>Please choose 2 ch 16-bit integer. 1.In order to enjoy the 4K high resolution, please make sure to use HDMI 2.0 cable. 2.Supports resolution up to [email protected],but we recommend you to make sure your monitor/tv could supply corresponding output. That means if your computer supports [email protected], while your monitor/TV only supports 1080p, you can only output 1080p rather than 4K. 3.If the resolution of your laptop is higher than the external monitor. Windows Menu–> Setting–> Display–> Advanced Display Settings, set your laptop’s resolution same as or lower the resolution of external monitor. Left-upper Apple icon–>System Preferences–>Displays–>Mirror displays. Then your HDMI monitor would mirror your Mac. However here you have two choices. One is “Optimize For” your built-in Retina Display, the other is “Optimize For” your HDMI monitor. You can choose which one you like. 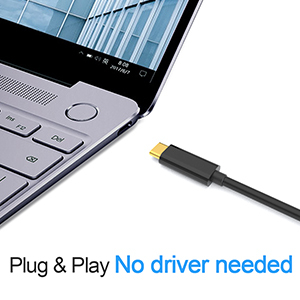 For Lenovo Yoga 910, please always use the white USB-C port. Keeps up with the latest trend of USB interface. 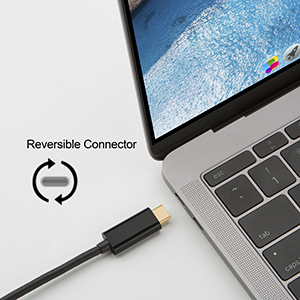 This user-friendly design allows you to plug into all your USB Type-C compatible devices without worrying about the orientation of the port. 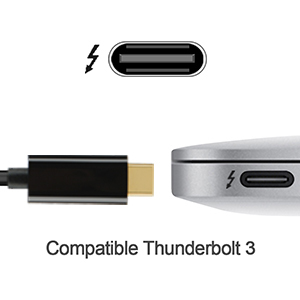 Compatible with Windows 10/8/8.1/7 / Vista / XP and Mac OS X, Linux and Chrome OS.